Galbraith’s – Trappist Style Ale. Not a style that is big in NZ or really many places, and this was a special limited run beer, as many are, but this one dressed up in the magnum sized bottle as a celebration. I brought one because you know the last 30 beers to the 1,000 and because I like a Trappist ale, I tell myself. 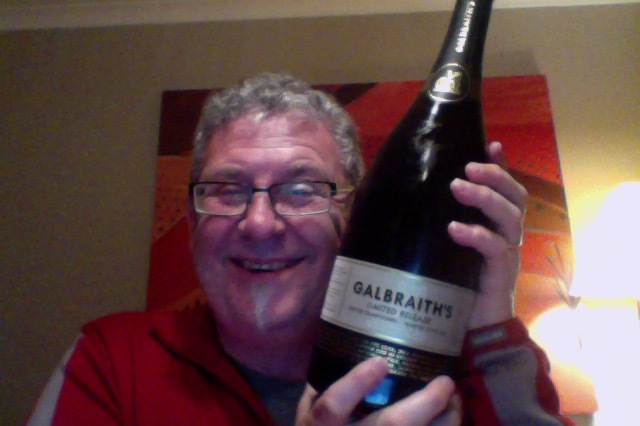 This drinking alone and with the Magnum though, this really is going to test what exactly could go wrong…. Also I’ve said that beer is not a treasure, and it isn’t, sure you can cellar it, but it’s not an investment really. There should be only 500 bottles (magnum) of this and suddenly there’s one less in the world, so I’m doing my part. [Spolier Alert.. I should have saved it]…. I was wrong in the video, it’s bottle 417 and not 471. These things are important. A Magnum sized, 1.5 litres, in a limited edition bottle, mine is bottle labelled 417 of 500, of a beer that is 8.7% ABV, 261 calories a serve This whole thing is about 10.3 standard drink units of a beer. This complex Trappist Style Ale exhibits rich notes of toffee, dried fruit and bottle conditioned depth of bready banana flavour. A copper-red malt base broadens out into warming clove and vanilla spice, layered under a touch of dry hop, with a long textured coffee and chocolate finish. Dont be intimidated by the depth of flavour, despite its complexity, this beer remains highly approachable. Brewed in homage to the highest echelons of Belgian brewing standards, this is the beer enthusiasts dream. For collectors, it will mature for a further 4-5 years, gaining further complexity. Aroma when you twist out that cork, with a lively pop, is of deep sugary fruit richness. Pour is lively, and you get a half/half kind of beer. Aroma carries some of that sugar sweetness but not a lot. Superb dark red beer, with a head and half, The aroma isn’t strong, but it’s brilliant looking beer. The taste is lovely a richness and sweetness without an alcohol tang that you expect but don’t get. Fruit sweetness might be too sweet but seems natural and not forced. Not like I thought it might be and better for that. Taste is lovely, I thought a bit like liquorice, the alcohol tang something you’re expecting but don’t get. I also think there a lot of blackcurrant. There’s a lot to love about the theatre of this beer. There’s a lot to love about this beer. At the moment on the apps I’m I’m rating this about 4.25/5 so 9.5/10. There’s still a top heavy fruit syrupy thing going on, they are really bright, and this isn’t a weird thing, except you expect more a raisin kind of thing, particularly if you have styles confused 🙂 but you don’t expect a Dubbel to be fruity. But it’s downfall is that it’s too fruity, it’s a bit syrupy, and there really should be a harder bit where the alcohol bites and just hints at what you’re doing. The pdubyah-o-meter rates this as 10 of its things from the thing.It’s a lovely looking beer, dark rich, the head a tinged white that is firm and full. There’s no lacing though in the glass. There is a lot of fruit brightness and not a thing about the alcohol tang sharpness. If anything it is too much fruit and not enough sharp. It’s hard to think you’d be judged on a 500 bottle run of beer. I wish I’d saved this some more, I’m pretty sure that tin a few months this has become a better beer, and give n a few more months this is going to be spectacular. There are beers that I rate on the various platforms as, for instance, 9.5 of 9.25. but on reflection and because it’s all about me and how I like beer, and not what you might like, I’m compelled to say that the beer I had is a beer that I don’t have a fault with. This is one like that, of many. But then again what do I really know? Where did I get it? Liquorland in Forrest Hill had some, elsewhere Glengarry’s. Am I enjoying it? I am really liking this beer. Would I share with a friend on a porch and set the world to rights? I would and I’d invite both my friends 🙂 and have an amazing time. Beer like this is rare because they don’t make much and rare because it really is a bit good. 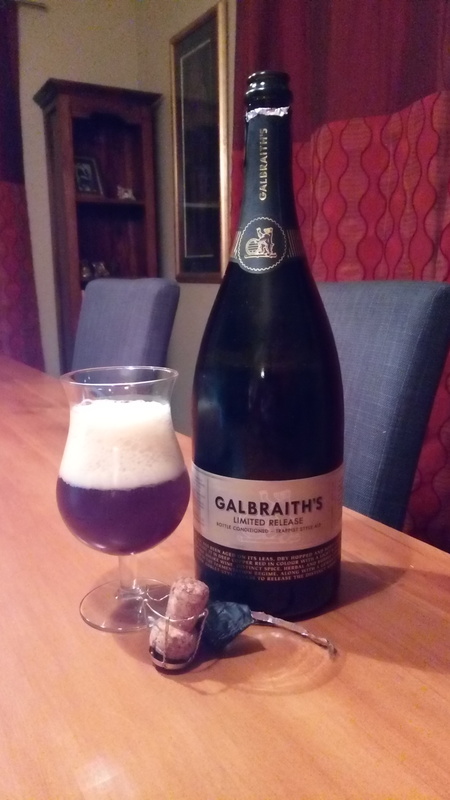 This entry was posted on September 2, 2017 by Philip Walter in Abbey Dubbel, Beer, Beer of New Zealand, Beer Review, Craft Beer, Critic, Galbraith's and tagged Abby Dubbel, Beer, craft beer, galbraith brewing company, Galbraith's - Trappist Style Ale, Galbraith's Ale House.